Designed for RS-232 serial or parallel applications. Easily connect your printer, modem or other DB25 device to a switchbox. Designed for RS-232 serial or parallel extension applications. Fully molded connectors with thumbscrew provide you with a quick and easy connection. Ideal for extending your existing parallel cables to connect to a modem or a switchbox. 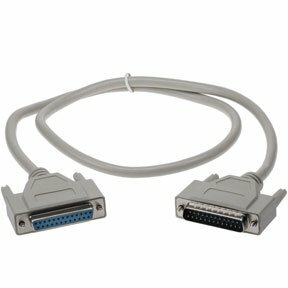 The DB25 cables are designed for RS-232 serial or parallel extension application. It can be used for older printers and PC with parallel connections. Our range of DB25 Serial Cables include DB25 M/M Straight thru Molded Cable, DB25 M/F Extension Straight Thru Molded Cable, DB25 Male to CN36 Male 25C Molded Cable, etc. All cables are available in different lengths to cater to individual requirements. SF Cable ensures that customers get quality products at nominal prices. We source all our products directly from ISO 9001-2000 certified manufacturers and also provide lifetime technical support on all our products.